Birmingham is full of family activities for kids of all ages. Toss everybody in the minivan and head over this way to spend some quality time. The kids will see you in a whole new light. Start the morning with breakfast at Over Easy, where mom and dad can have locally-roasted, fresh-ground coffee and everybody will love the menu of Lumber Jack Potatoes and Italian Eggs Benedict. Then it’s off to the nearby Birmingham Zoo for an educational and entertaining morning with the animals (not your kids—the zoo animals). More than 800 animals of 200 different species make their home here. The “Trails of Africa” exhibit has a herd of bull elephants along with other African animals in a replicated setting. Yes, we know, the children are hungry again. Try Brick & Tin for a beautiful selection of sandwiches, soups and salads. You’ll love the brisket or pork belly panini. Now gather up everyone to ride up Red Mountain to visit Vulcan, Birmingham’s most recognizable symbol. The youngsters will be delighted to find that Vulcan has no pants, and his broad backside welcomes visitors to Vulcan Park & Museum. Take the elevator up to the viewing balcony to see the sights from the largest cast iron statue in the world. The Fish Market on Southside is a good choice for family dinner. Parents can have an adult beverage—well deserved by this time—and the eatery has a kids menu with a good selection. The savvier patrons will appreciate the heavy Greek influence on the dishes served here. 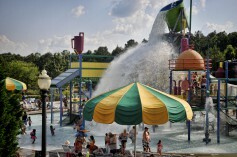 If you’re visiting in the late spring or summer, pack up the beach bag and sunscreen and plan to spend the day at Alabama Splash Adventure. The teens and tweens will want to ride the Rampage wooden roller coaster time and again. In the water park area, everyone loves Junior Bumper Boats and Neptune’s Plunge. If you’re not too pooped to ponder dinner, consider the Mexican-American fusion at Rojo. This Highland neighborhood restaurant is a local favorite, and the dueling Mexican and Americana menu serves up fajitas and quesadillas alongside burgers and hot wings. Oh, and Bob Dylan ate here once. If it’s the offseason for Alabama Splash Adventure, there’s still plenty to explore. Start out with a good meal at Edgar’s Bakery downtown, serving hot breakfasts and yummy pastries. Then make tracks for Barber Vintage Motorsports Museum, just east of town in Leeds. 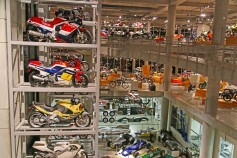 Children and adults alike will be dazzled by the world’s largest display of antique and contemporary motorcycles. Now at four floors and expanding, this collection is major eye candy for the uninitiated and may cause heart palpitations for diehard racing fans. More family-friendly activities await at the Birmingham Museum of Art. Send Mom off to see the world’s largest collection of Wedgwood while Dad takes the children to Bart’s ArtVenture. 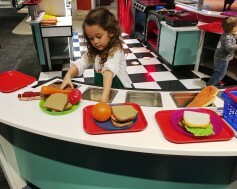 This hands-on area is the museum’s state-of-the-art interactive gallery where children can explore art at their own pace, guided by their own interests. And Mom, while they’re happily occupied, be sure to stop by the museum gift shop, which has a nice selection of jewelry, scarves, notecards, and all sorts of quality trinkets. Time for lunch in the Birmingham suburb of Homewood, where you’ll find Little Donkey. This is traditional Mexican food with a Southern flair, so don’t expect fake bean and cheese burritos. Try the El Fresco or the Adorbada Torta for some real goodness. Now for dessert, step right next door to Steel City Pops for the best popsicle you ever popped in your mouth. The Buttermilk Pop is a surefire crowd-pleaser. 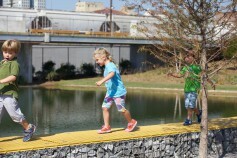 Railroad Park is the very place for the young ones to spend some of that energy. Let them run and play to their hearts’ content in this handsome downtown green space. More outdoor fun is at Red Mountain Park, where the adventures are designed for children and adults of all ages. Try a flight over the treetops on the Red Ore Zip Tour. Take the challenge of swaying bridges, tight ropes, wall climbing, and more in the Hugh Kaul Beanstalk Forest. Or grab hold at the 80-foot-tall Kaul Adventure Tower, with eight lanes for rappelling and traditional rock climbing with hand-holds and vine climbs. Then there’s the Mega Zip, which offers 30 mph speeds at great heights for those who like to get their adrenaline up. By now everyone is practically starving. A good choice for supper is Jim ‘N Nicks Bar-B-Q in Five Points South or other locations in the area. Their ribs are not to be missed, and ask your server to keep the homemade cheese biscuits coming. 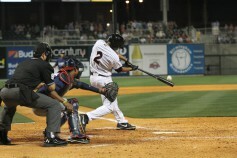 If it’s baseball season, catch an evening or weekend game with the Birmingham Barons at Regions Field. The stadium has a commanding view of the skyline and affordable family-friendly entertainment for all ages. Visit the nearby Peanut Depot. The amazing aroma of roasting peanuts will lead you to this one-of-a-kind shop where old fashioned ovens crank out thousands of pounds of peanuts a week. Buy a dollar bag or a truckload.